The Sony Xperia Z manages to marry a dust- and waterproof design with a stunning 5-inch full HD display and powerful 1.5GHz quad-core processor for a truly super-phone experience. Carrying IP55 and IP57 certificates, you can take the Xperia Z for a dip in fresh water up to 1 metre for 30 minutes, meaning a trip into the bath or a slip into the toilet shouldn't end your phone's existence. You can also rest easy when you next head to dustier climates as these are no problem for the tough Sony Xperia Z, which laughs in the face of such danger. And if all that wasn't enough, if you were to drop your Xperia Z in the mud at a festival, the smartphone can easily handle a tap of running water to get it clean again. Couple this stand-out durability with a super-slim 7.9mm chassis, reflective glass surface and a wealth of features under the hood and you'll realise how the Sony Xperia Z can deliver the ultimate smartphone viewing and performance experience. 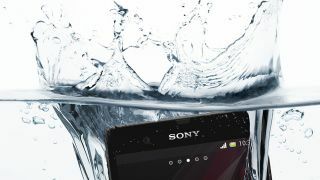 We put the Sony Xperia Z through its paces in the video below, including its water-resistant abilities.